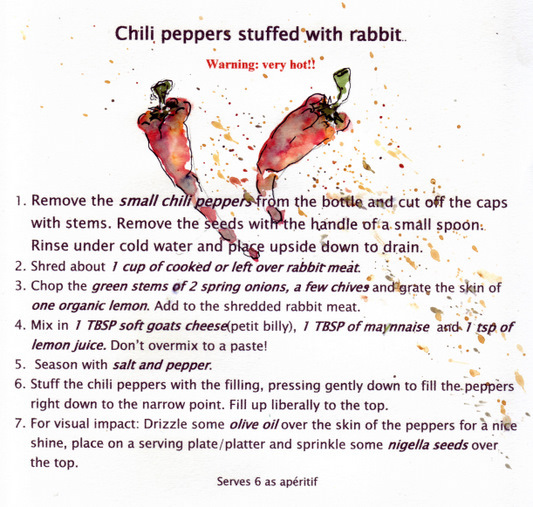 Chili peppers stuffed with rabbit..and a home library. I had left over rabbit. And small chili peppers. Some goats cheese. Herbs. And guests for dinner. As un apéro, these would do perfectly. But BEWARE: They are very hot. While I was preparing them, I took a tiny bite from one and it was fairly piquant, but not as I expected and I continued happily. BUT THEN… later the afternoon, I propped a smallish whole one in my mouth….well, I flounced desperately around the kitchen table, like a horse being backed for the first time. I fled outside in the rain for oxygen and help. Not finding it there, I scrambled back to the fridge and gulped down 6 joghurts… I think next time I will use the mild spanish red pepper instead…but oh, these look SO pretty on a platter…! Use left over chicken or duck or turkey instead of rabbit. When using duck, leave out the cheese and replace with balsamic vinegar and grated apple, sprinkled with lemon juice. 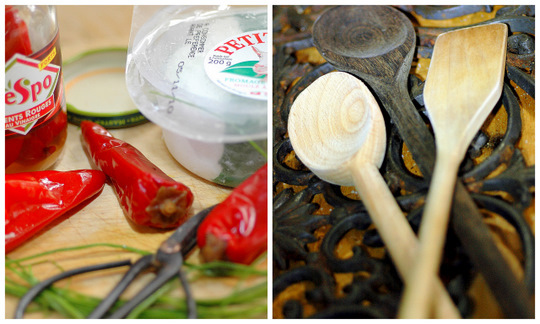 Ricotta cheese or créme fraîche can be used in place of the goats cheese. 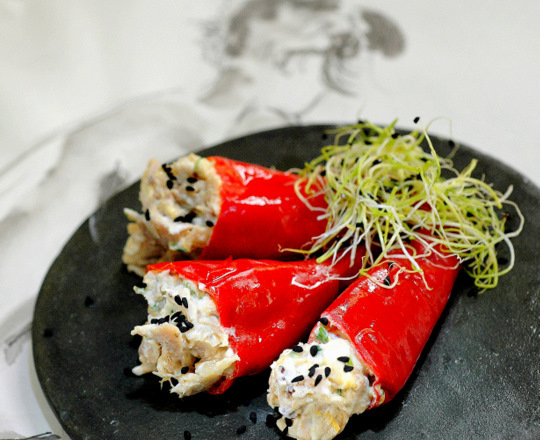 Serve as a sterter with a small green salad, or serve as an apéritif with a cold white wine. If the chili peppers are too hot to your liking, use the long Spanish red peppers instead and cut them shorter from the thin point upward. 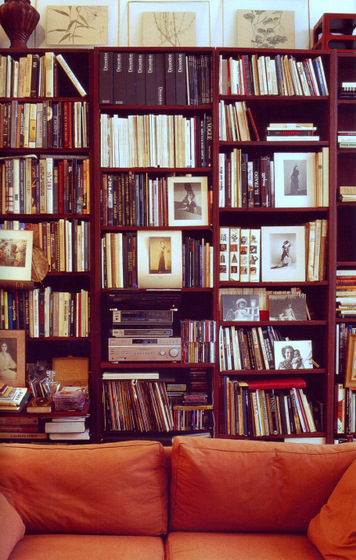 We don’t have a libraryat home, only “corners” of books which I try in vain to keep neat. Now I look past it and only try to balance out the stacking in order to prevent a shelf from breaking. 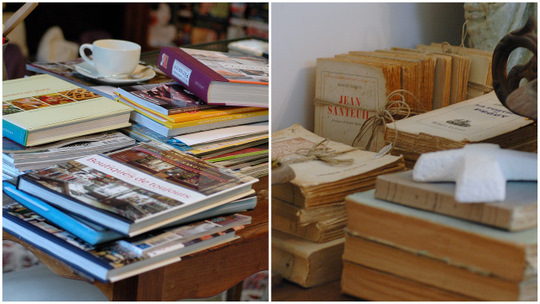 And I LOVE it when people come here and pick up a book…! 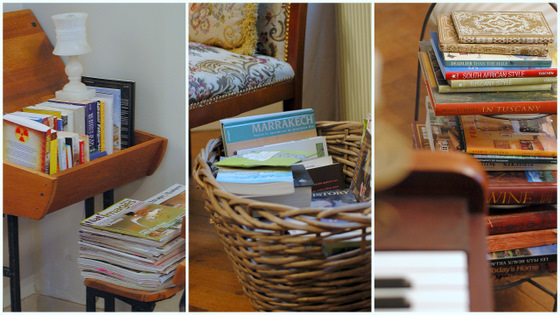 ..books on the coffeetable, by the bed, decorating corners(which I HAVE read and still reread, yes).. 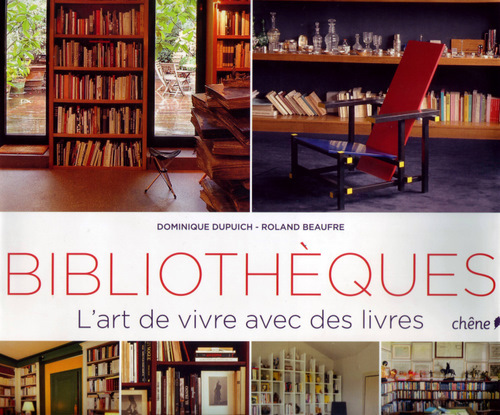 I bought this beautiful and inspiring book on libraries a while ago: BIBLIOTHEQUES – l’art de vivre avec des livres by Roland Beaufre and Dominique Dupuich..
..BIBLIOTHEQUES - l'art de vivre avec des livres by Roland Beaufre and Dominique Dupuich.. 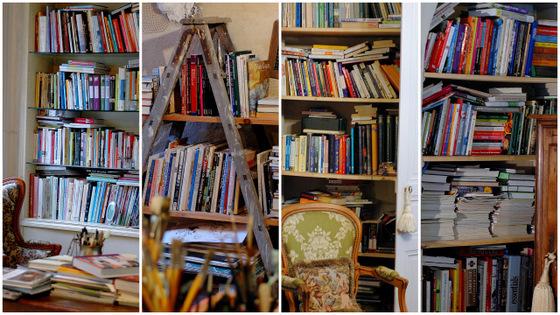 These next two libraries, are my most favorites in this book…if you leave me in either of these two, I’ll just happily disappear and you’ll never see me again! ..from the family Tazi, at Rabat..
Another wonderful treasure of books! 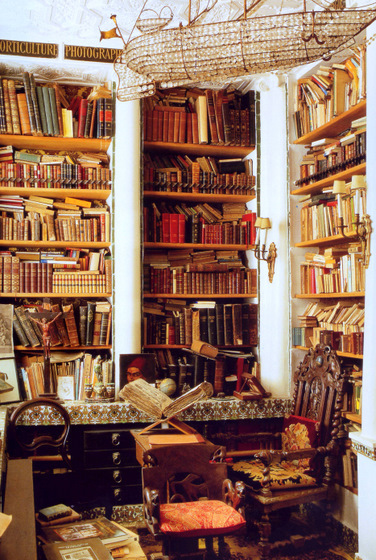 ..library of the Parisian decorator, Laure Welfing in Tanger.. 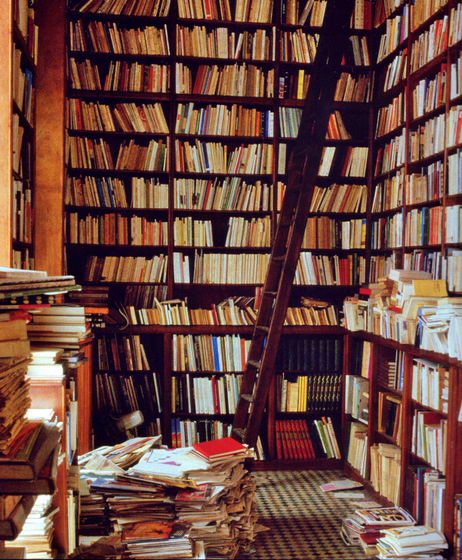 This library below is beautiful…too beautiful actually. I feel like someone’s is whispering…:”Don’t touch”! 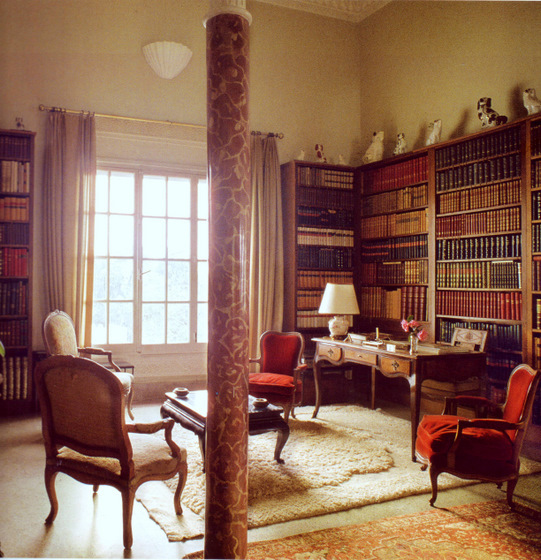 ..a bourgeoise library in Tanger..
..working space/library of Gilles Neret in St-Germain-de-Prés, journalist and editor.. This inviting couch and the lamp won me over! 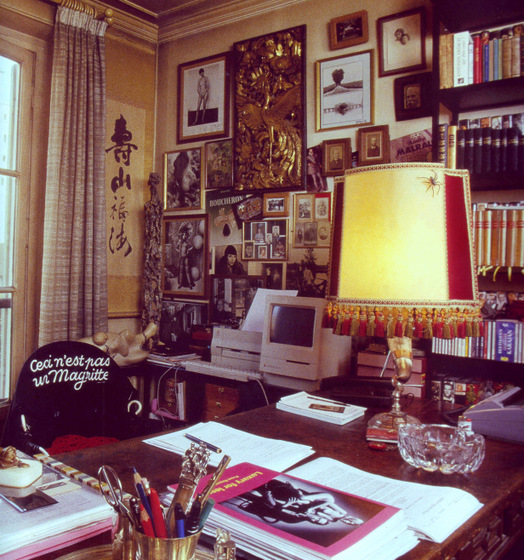 ..library/working space of art writer, Francois Jonquet with a bohemian flavor..
A bit less chaotic, but still inviting with its couch and music station, the warmth of family photos, botanical prints…and of course…MANY books!! 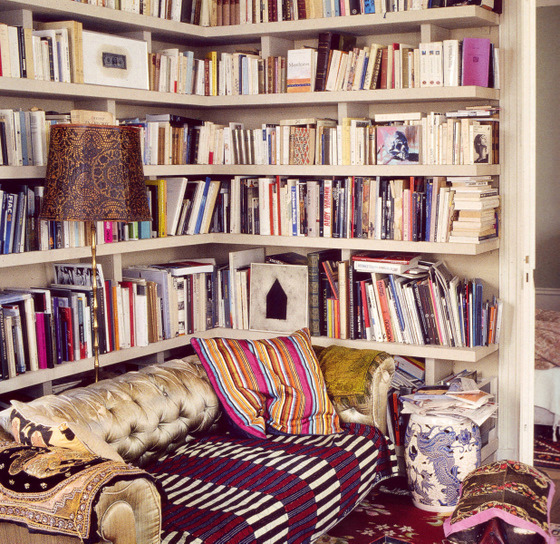 ..library of decoration journalist, Pamela de Monbrison.. I hope this kicked you into a mood of reading, like it did me…and instead of watching a good DVD this weekend, let’s make it one of reading those oldies we haven’t touched in a while! Ambiance 22/10: Spaghetti squash with three-tomato-sauce..and autumn flavour. 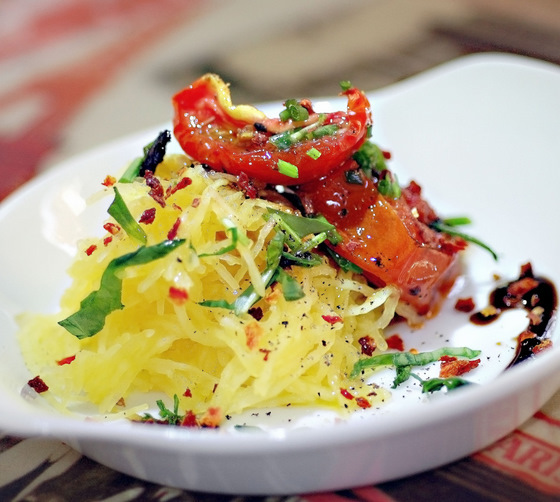 Spaghetti squash makes for an quite an interesting meal…served with a homemade tomato sauce, or with oven baked tomatoes. Especially great for those who want to cut down on carbohydrates…and calories..
Don’t overcook the squash, or else it won’t shred off in strands, but be mushy. The squash on its own is fairly tasteless and bland, so take care to make your tomatoes/sauce flavorful. Instead of oven baked tomatoes, a tomato sauce can be made by sauteing some onions, adding chooped tomatoes and reducing at low heat until thick anad flavorful. Season with salt and pepper, lemon juice, balsamic vinegar and add shredded basil leaves. Chopped olives and parmesan cheese can be added when serving the dish. Marinate tomatoes are tomatoes that have been dried in the oven until semi dry and still holds juice. It must be refrigerated and doesn’t keep as long as dried tomatoes, but is much more flavorful. This spaghetti with sauce can be served as an accompaniment to any kind of fish. I don’t do a lot of fall decoration, but I do like a little pumpkin and some fresh autumn fruit here and there. Some leaves… Nothing very whoo haa. Just a little something. A little autumn flavor brought inside. Normalement je ne fais pas trop de décoration d’automne, à l’exception d’une courge çà et là. J’aime aussi les fruits saisonnales en abondances , comme des poires, de jolies pommes de saison et n’oublie pas de délicieux coings! Et bien sur, les belles feuilles mortes, que je ramasse quotidiennement partout sur mon passage, remplacent les bouquets de fleurs estivales. Je ne fais rien en grande pompe, mais tout ça donne juste un petit gout d’automne dans la maison et ses alentours. ..autumn leaves in white vase.. Flowers get replaced by autmn leaves and greenery, picked up on walks by the Loire..in vases, in bowls. ..sandpot with pumpkins...and old books with pumpkins..
Their shapes and smooth whiteness harmonize well with the rustic texture of outside walls and pots, urns and wooden surfaces. Outside they can stand quietly beside a pot planted with white cyclamen. Or even inside keeping a vase of drying hydrangeas company. Alongside apples, they seduce us with color and form. A still life.., there.., to admire and enjoy the quietness of autumn. Coasters. That tiny but important little thing, preventing me from going crazy. I hate any kind of “ring” on furniture…a water ring from a glass , a heat ring from a hot mug, a wine ring from a bottle…it drives me nuts. So I have coasters everywhere. Beside the beds, by the computer, on the office desks, in my atelier, in the kitchen , outside… since we have become a “lazy mug using” society, rings have become more visible on our furniture. A pity. I would easily vote for going back to a cup and saucer. But until then..coasters it is. Maybe this weekend could be useful in getting rid of all stain rings everywhere and go shop for a variety of affordable, fun coasters to enjoy a drink without stress! Les dessous-de-verres. Une chose apparamment petite, mais très importante. Moi, je ne supporte oas du tout les taches sur une table; soit si c’est une tache d’un verre d’eau, soit la tache dun verre du vin, soit une tache d’un “mug” de café… Ça me rend folle! Donc, j’ai des dessous-de-verres partoutes dans la maison, même à l’extérieur. Malheureusement, comme on est devenu une société de consommateurs de “mugs” de cafés, de “mugs” de thé, et de “mugs” de cacao, les taches commencée a faire leurs apparitions plus visibles sur les meubles à la maison. Dommage! Peut-être ce weekend peut-on investir dans quelques dessous-de-verres abordables et “fun”, pour que on puisse s’amuser plus tranquillement autour d’un verre ou d’un “mug” de café. Do we have time for a movie this weekend? Always! One of my favorite actresses, is Juliette Binoche. A great, versatile actress. I once received an amazing compliment…someone told me I remind him of Juliette Binoche. But … it was late at night and it was during a good meal with plenty of good wine… What I would like to have…is a laugh like her. A wonderfully spontaneous, bold and spirited laugh! Est ce qu’on peut regarder un film ce weekend? Bien entendu! Une de mes actrices préférées, est Juliette Binoche. Une fois, on m’a fait un joli compliment; quel qu’un m’a dit que je ressemblais àJuliette Binoche. Mais…c’etait au cours d’un dîner, il etait, tard, et on avait bien bu… et pourtant, j’aimerais tellement avoir son merveilleux rire, si charmant, si spontané, si vif et si audacieux! Copie conforme plays off in Italy, spoken in English, French and Itaian…to me a great film by Abbas Kiarostami. So we have arrived at October for 2010….and of course…weekend! I will continue working in my garden, preparing it for autumn, cleaning and changing, planting some bulbs… What ware your plans for this first weekend of the beautiful month of October? Voila. On est arrivé en Octobre 2010. Et en plus…le weekend! Je continuerai à travailler dans mon jardin. L’automne demande la plantation des bulbes, le nettoyage, le bouturage et la préparation pour le printemps. Qu’est ce que vous prévoyez vous pour ce merveilleux weekend d’Octobre? And any suggestions for a good movie for the weekend? How about some suspense this time…Johnny Depp in Secret window..